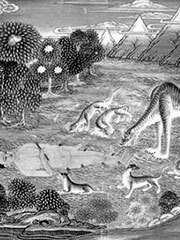 The Jataka is a voluminous body of folklore and mythic literature, primarily associated with the Theravada Buddhist tradition, as written in the Pali language (from about the 3rd century, A.D.); however, the stories found in the Jataka have been found in numerous other languages and media — many of them being translations from the Pali versions, but others are instead derived from vernacular traditions prior to the Pali compositions. Sanskrit and Tibetan Jataka stories tend to maintain the Buddhist morality of their Pali equivalents, but re-tellings of the stories in Persian and other languages sometimes contain significant amendments to suit their respective cultures. In the 6th century, some of the stories were translated to Persian at the command of the Zoroastrian king Khosrau I. This translation was later retranslated to Greek, Latin and Hebrew. Some people believe that they formed the basis for Aesop’s Fables, Sindbad the Sailor and The Arabian Nights. Generally, the Jataka stories have disseminated from India to become part of the world’s folk-literature, in numerous variations, with the Pali recensions representing one cultural (and religious) notion of what the stories «ought» to be. The term «Jataka» refers to the Buddhist trope of treating each story as an incarnation of the Buddha-to-be prior to his enlightenment — although this is sometimes clearly a super-imposition over an earlier (i.e., pre-Buddhist) fable. Jataka tales are not considered Buddha-vacana, i.e., generally, Theravada Buddhists do not accord them the authority of being the actual word of the Buddha, and Sri Lanka orthodoxy maintains that they are not canonical writings. However, in Burma and elsewhere they are included as part of the Pali canon, and these tales have been among the more popular and influential segments of Buddhist literature, irrespective of their heterodoxy. In Theravada countries, several of the longer Jataka tales are still performed in dance, theatre, and formal (quasi-ritual) recitation to this day, and several are associated with particular holidays on the Lunar Calendar used by Cambodia, Thailand and Lao.